Elliptic cups create high torque & linearity for good data consistency over a wide range of weather conditions as compared to conical and spherical cup designs. ﻿Robust easy to replace bearings and cups for easy field maintenance. 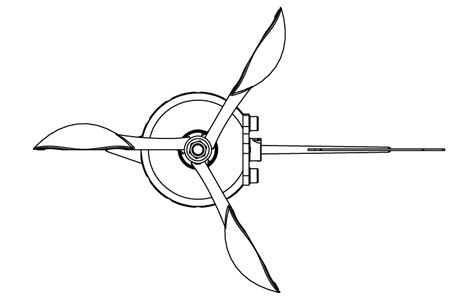 Elliptical cup design offers large wind blown area for high torque and very-low starting speeds. Excellent linearity and accuracy meeting all World Meteorological Organization (WMO) measurement requirements. Excellent off-axis response with a very low distance constant due to reed switch operation. Flat elliptic cups offer resistance to snow buildup improve snow shedding over conical and spherical cups. Compact anemometer with all metal construction and precision that exceeds WMO standards. 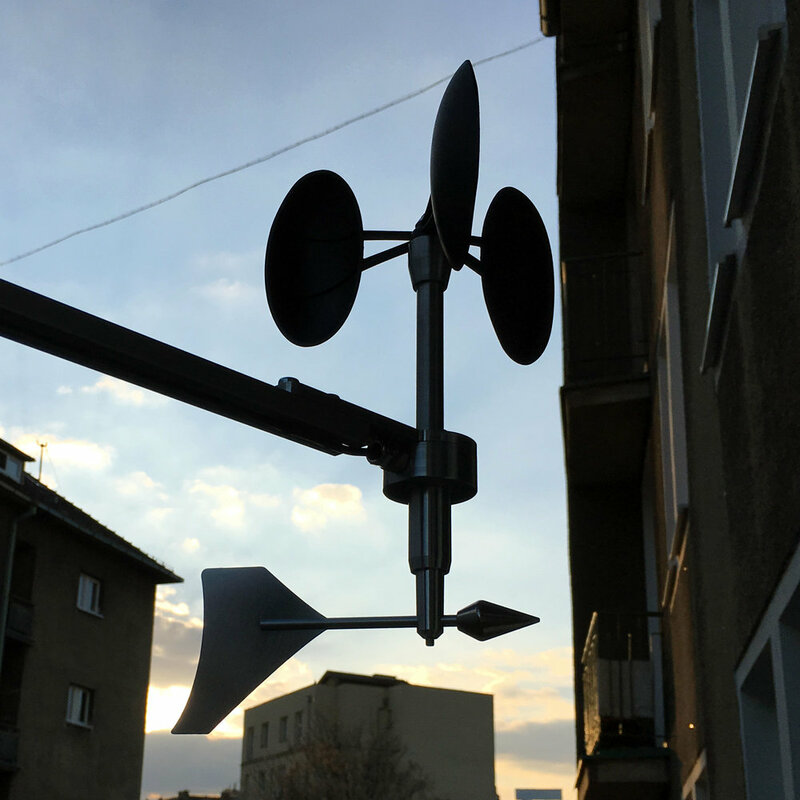 MeteoWind Compact anemometer silhouette in a smart-city environmental monitoring installation. 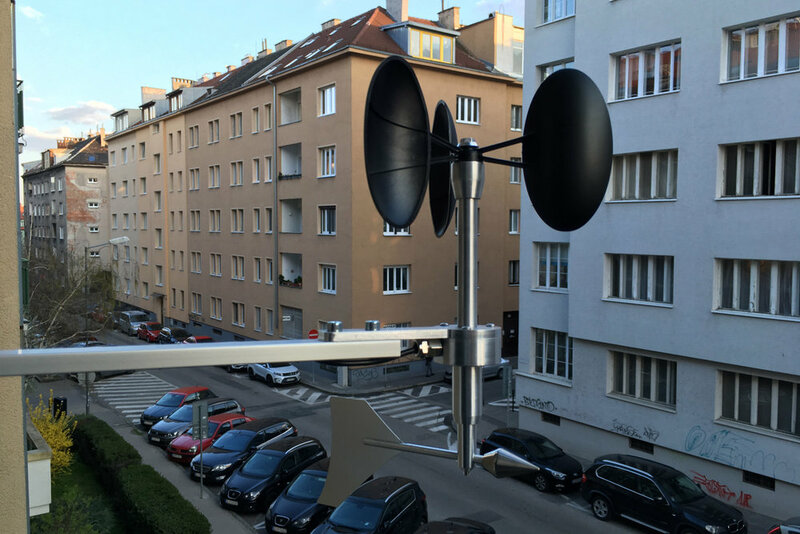 MeteoWind Compact is an affordable cost-effective wind sensor solution exceeding WMO accuracy and offering all-metal durability and robustness. Analog outputs for compatibility with all existing meteorological data loggers. Digital pulse output for wind speed with two pulses per revolution generated by a high speed reed switch for consistent and clean wind speed signal. Analog 0 V to 2.5 V wind direction signal generated by the robust all-metal wind vane is compatible by all meteorological data loggers. 2-stage lightning protection against over-voltage, over-current, high speed voltage & current transients, and reverse polarity gives MeteoWind Compact electrical reliability. Analog protected 0…2.5V voltage output for wind direction. MeteoWind Compact offers reduced cost of ownership and reliability compared to separate wind vane & anemometer installations for long-term economic benefits for industrial and AWOS weather station operators.